Foodies in the Czech Republic, 2010-2011: To Vienna in continued celebration of Mark's 60th Birthday! 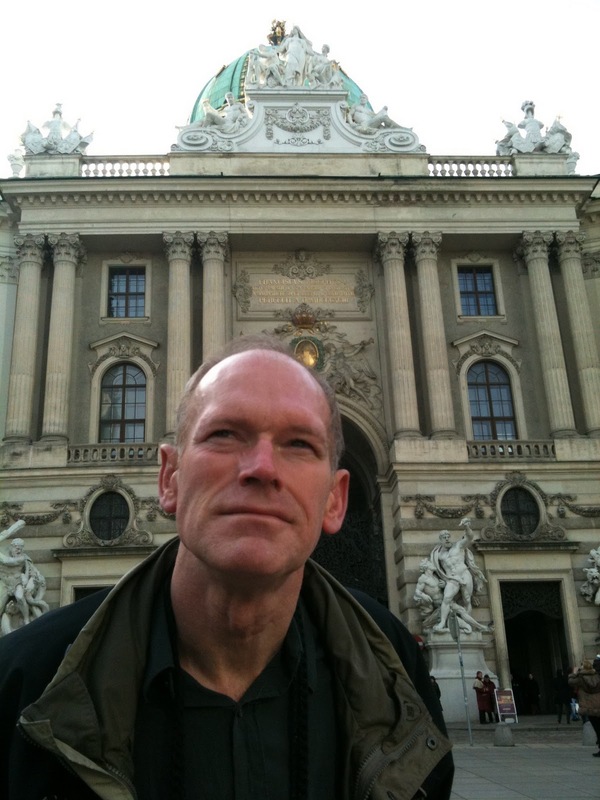 To Vienna in continued celebration of Mark's 60th Birthday! 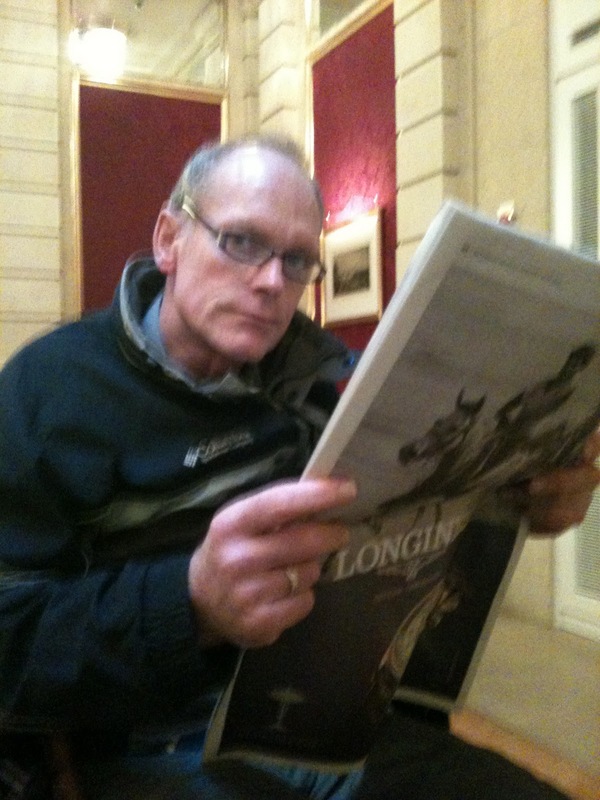 Originally Mark had wanted to go to Paris via train to celebrate his 60th birthday but we diverted that plan for spring when the weather will be more pleasant. This turned out to be beneficial as his birthday was a somewhat cloudy, foggy wet day that would not have been any better across continental Europe. discussing so many topics in English, enjoying noshing on fruit and nuts (including Moravian and Bohemian walnuts to crack open) while sipping superb wines. Then, an astounding dinner resplendent with fresh herbs, 3 kinds of homemade bread paired with an exquisite chicken-based soup melded with eggs and fresh herbs, delicate local lamb and roasted duck, smashed potatoes, carrots from their garden, ...later ending with a Quince Frangipani Tart that we had brought. The hiatus of the evening was having our talented friends dance two Tangos in honor of Mark's birthday. They are so skilled and polished dancing the Tango! It was an exquisite evening and one that we will never forget. We look forward to many future happy times with these friends! A week after Mark's actual birthday, we headed to Vienna for continued celebrating.... We had gone there two years ago and loved the city, of course (who wouldn't?!). Mark had a couple of agenda items to accomplish while there, namely to have the original Sachertorte at the Sacher Hotel (we have been tasting tortes across Austria in the cities where they originated; see Neil's Linzetorte adventure posted earlier) and visit the Lipizzaner stallions at the Spanish Riding School. Other spontaneous events were sure to be tucked in amongst the festivities. Neil seems to catch the excitement, too! We pass the southern foothills of the Alps here in South Bohemia as we rail onwards into Austria. 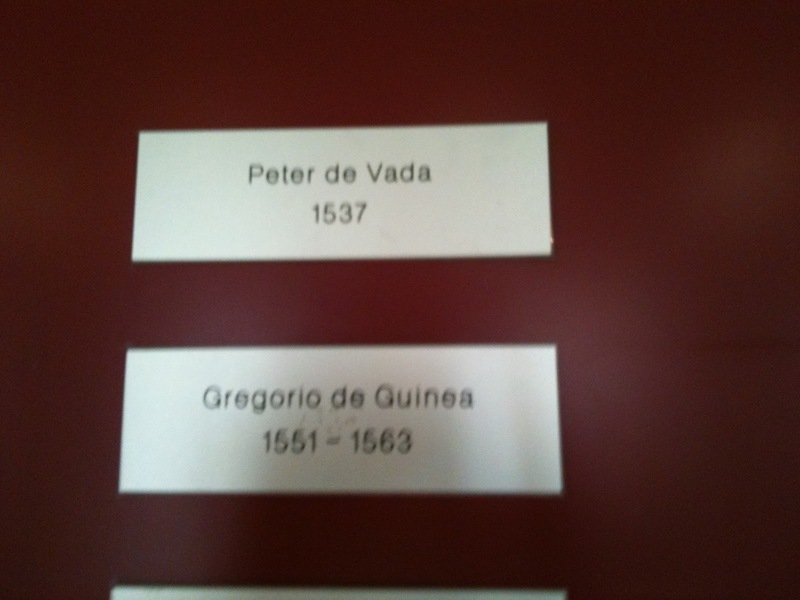 Of course, a few other famous composers have also stayed here.... This is the second hotel that we and Mozart have stayed in (the other was in Innsbruck, Austria...the Golden Adler; see earlier posting). The Kaiserin Elisabeth Hotel is a delightful place to sit in the elegant reading room with glass ceilings (above), where you can have a glass of wine or sherry in the afternoon, read a newspaper in English or German, and generally relax, which we did! After we freshened up from the long journey, got settled into our room, and caught our breath for a minute, we ventured out to explore the city....a follow our noses sort of affair. 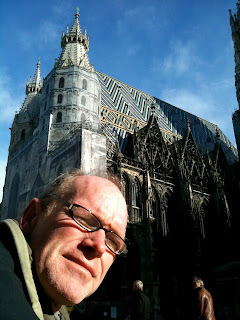 First, to the Stephansdom Platz where one can gaze at the gorgeous cathedral that took centuries to build, resplendent with Renaissance and Medieval structures. The fancy, patterned tile roof was partially destroyed at the end of WWII but has been fixed. 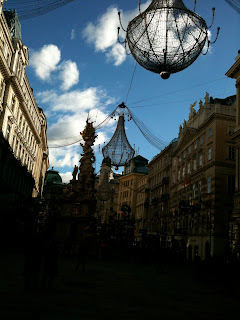 Around various Medieval streets of Old Vienna we go, looking for a fun little cafe or coffee house in which to have a light lunch. Who'd ever guess it's a January day with the sun shining so resplendently, warming everyone such that we didn't need anything other than spring coats on? 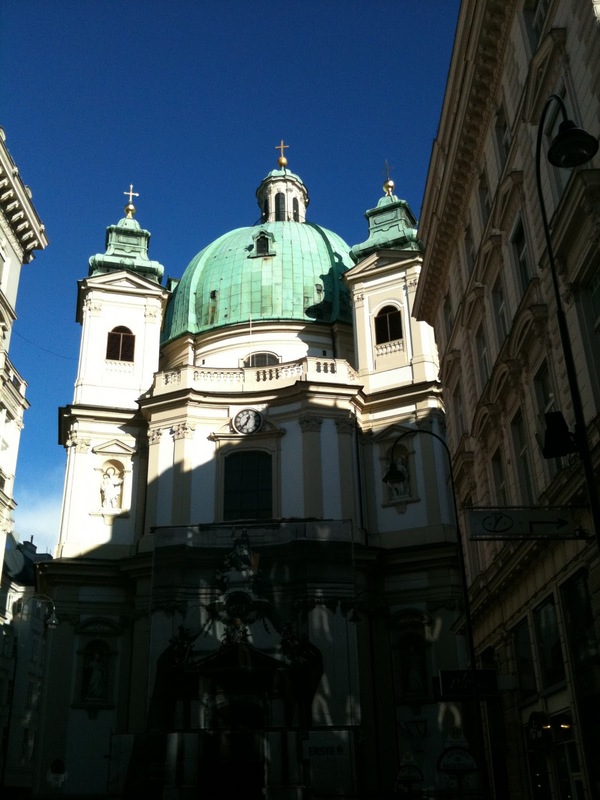 along with numerous other churches (which were, of course, quite influential in old Vienna). This is Peterskirche (St. Peter's Church). Other glorious buildings always catch our eye....the details, Corinthian columns, and exquisite mix of colors. 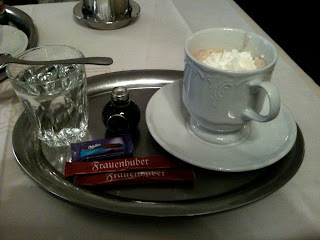 We're off to the Frauenhuber coffee shop (just a few steps down the street from our hotel), the oldest Cafe in Vienna, for a bit of hot toddy, a light lunch and a bite of Sachertorte (not the original one...that's coming tomorrow) and Apfelstrudel. This cafe had guests entertained by Mozart in 1788 (he performed a pastorale by Handel) and Beethoven in 1797 (when he performed his own Quintett for Fortepiano with four Horns). 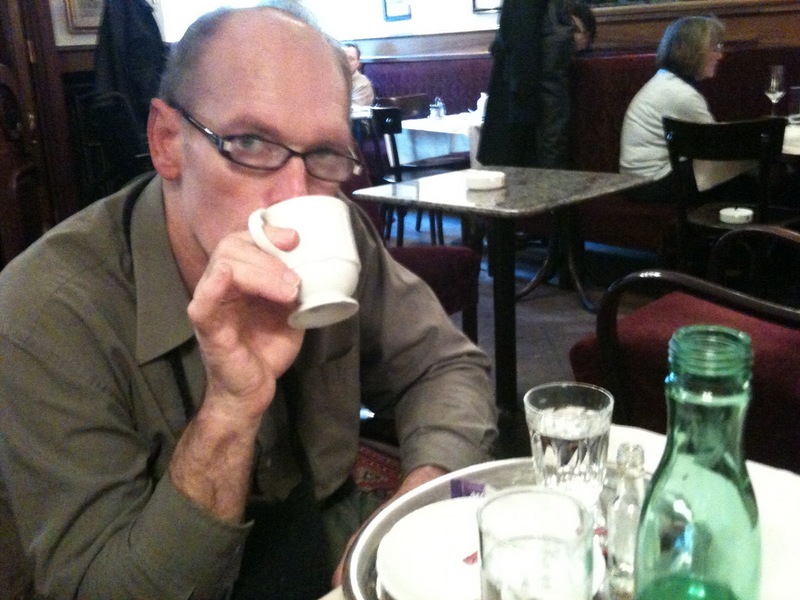 We later learned that Mozart's last pubic appearance as a pianist occurred here, 4 March 1791.
while Neil sipped a Mozart coffee, with special Mozart liquer! 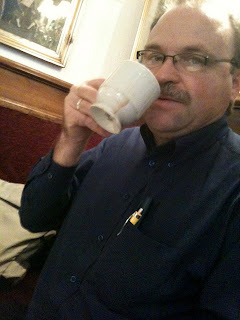 Feeling quite refreshed, we retreated back to our hotel and got seduced into purchasing tickets for a performance that evening to hear a quartet in Renaissance outfits perform Mozart and Haydn in the very music hall (The Sala Terrena) where Mozart had performed numerous times (located just near where he stayed in Vienna). So, while waiting for this to begin, we thought we'd tour around the Medieval city streets again now that dusk had arrived. 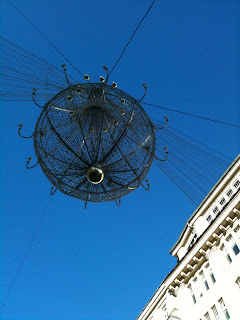 The chandeliers are now lit and the city is coming to life! A set of break dancers performed for Mark and Neil....dancing with bare hands touching the cold marble streets! 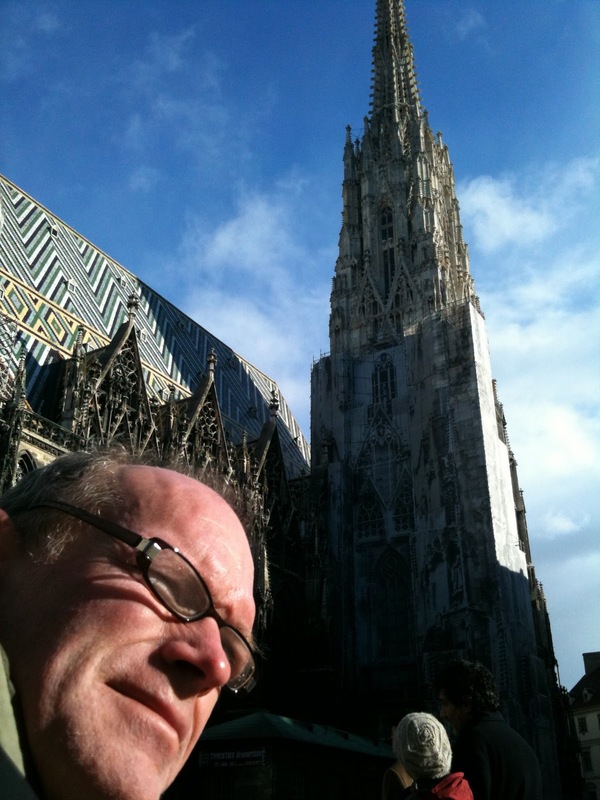 Then the sky clears and the lunar orb rises next to the Stephanskirche steeple. A perfect evening! was the small oval concert hall....The Sala Terrena... (in the house where Mozart lived, die Mozarthaus) where we trekked for the evening concert. The concert hall still has the original frescoes on the wall, full of vividly colored flowers, plants, ornate floral designs. The floral and animal scenes denote that this is a place of pleasure for both the soul and the body. 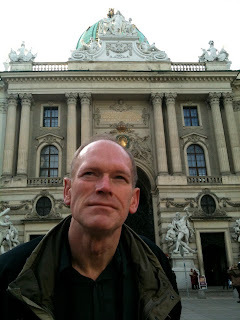 and other figures, such as der Lieber Augustin. 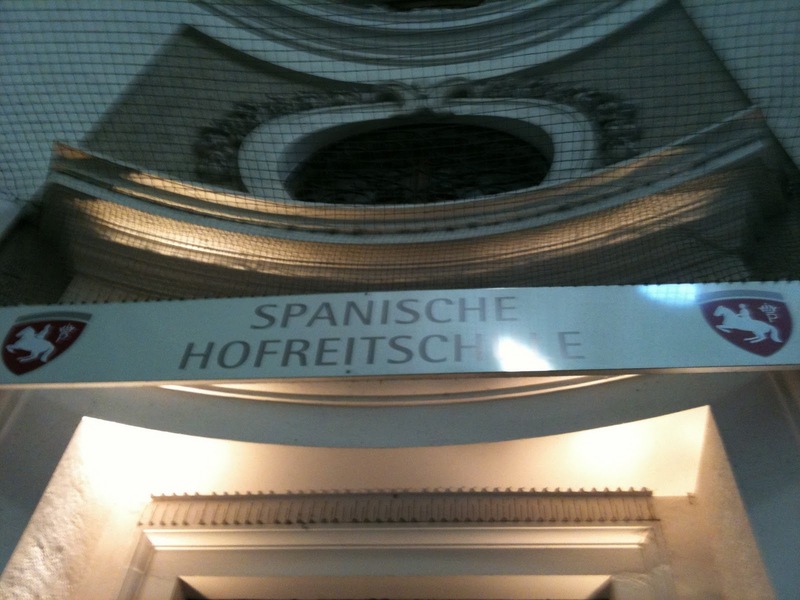 Konzerte in Mozarthaus, The Sala Terrena, Singerstrasse 7. This is the oldest concert hall in all of Vienna--a Baroque jewel designed and painted during the late 1700s. Mozart played and worked here for Bishop Colleredo in 1781. He lived in the house, 16 March - 2 May of that same year. And the music emanating from the Mozart Ensemble! The acoustics were perfect in the room, which seated ~45 people (quite tightly). When we closed our eyes to listen to Mozart's Divertimento in F-Dur KV. 138 and The Quartett in d-Moll KV. 421 we could see him there and feel his creative genius at work with the music. Later, the Mozart Ensemble played Haydn's "Quartett in G-Dur, Opus 76/1". Following the concert, we toured the church and listened to the remnants of the evening vespers as people filed out into the night. A truly glorious way to celebrate in Vienna. Dinner soon followed, although we were not very hungry after all of the coffee, lunch, and tortes. So, we noshed on salads...saving our calories for the next day. Notice, that it sells for 225 Euros! Later we headed down to the exquisite buffet in the hotel....numerous fresh fruits and hand-squeezed juices, coffee made to order, French and Austrian cheeses, cold cuts, yogurt, eggs, cereal, croissants, .... an endless array of temptations. 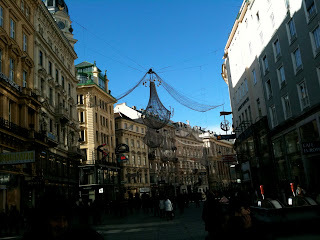 We had a glorious breakfast, later skipping lunch in order to work it all off around the streets of Vienna! As we head through Medieval Vienna, on our way to the palace where the Lipizzaner horses are stabled, we couldn't help notice this historic chocolatier, The Gerstner, displaying morning temptations! Other exquisite displays of petite fours tempt us inside (we did buy a couple samples! Remember, we only had salad for dinner last night). We amble past the Lobkowitz Palace, built for Count Dietrichstein in the 1680s. 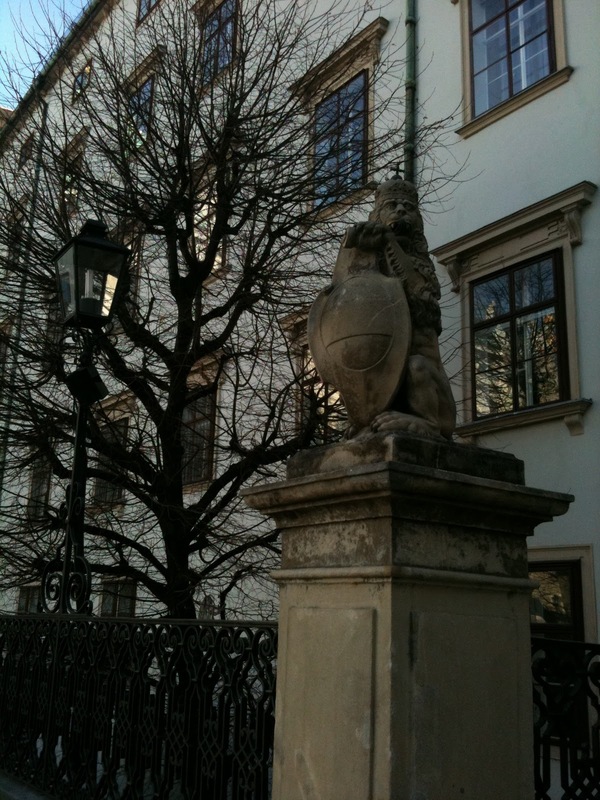 The Lobkowitz Family obtained the palace in 1753. 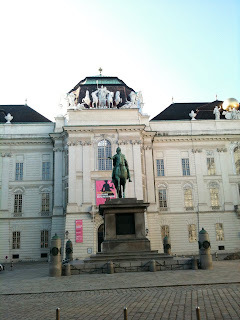 It now houses the Austrian Theatre Museum which displays a model of the Eroica-Saal (1724-9) where several Beethoven compositions were first performed. 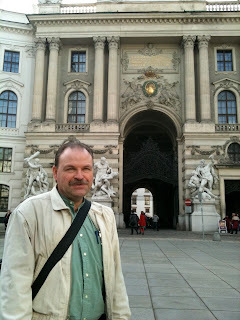 This gateway (16th century) leads to the Schweizerhof, once a four-towered fortress--it is the oldest part of the Hofburg Complex. As we mentioned earlier, the Lipizzaners had declared themselves on holiday, so there were no performances at all today (none until mid-February!). We toured the stables instead, but couldn't take any pictures once we were inside. 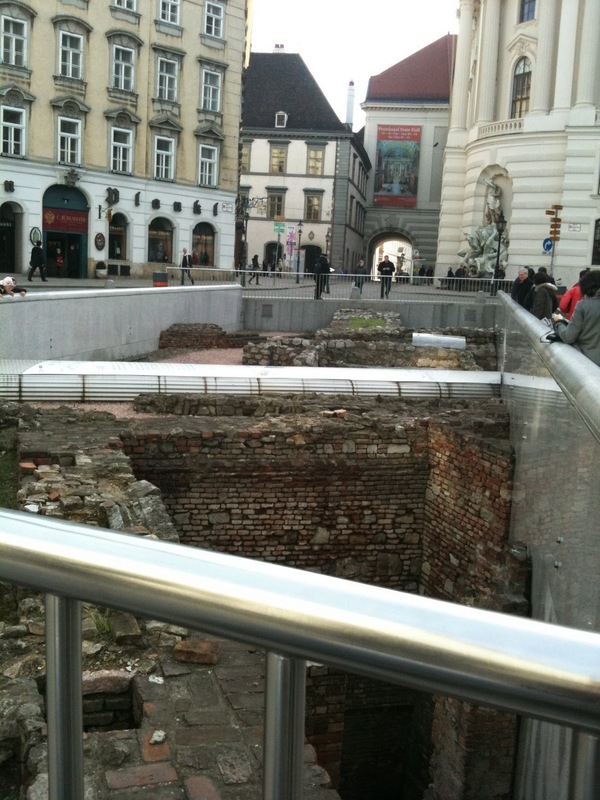 Here is the interior of the stable courtyard (formerly the Stallburg Palace), where the riders were supposed to live (it's a bit too cold, however....most choose to live elsewhere in Vienna). 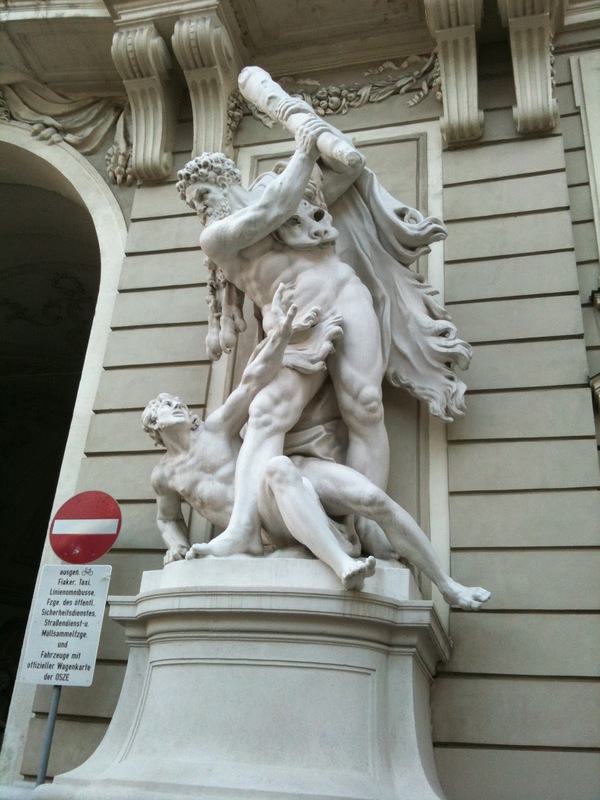 This is a good example of Renaissance architecture in Vienna (few buildings remain that weren't later transformed into Baroque). The numerous chimneys were status symbols....anyone with wealth could afford heating! 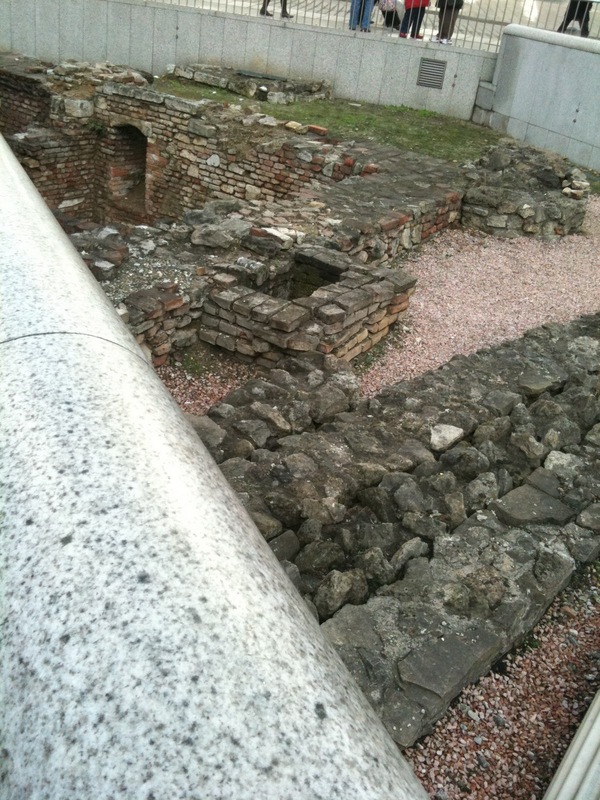 Many of the chimneys were false, however, due to money issues of the ruling family. In order to be a rider of a Lipizzaner Stallion, you must successfully complete the 12-year course! Originally only Austrians were allowed to be riders, but now any member of a European Union country may apply; both men and women may apply. 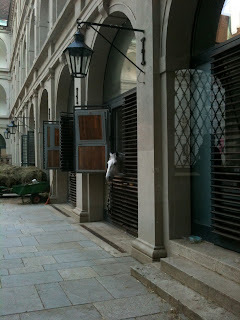 One of the younger horses (not a current Lipizzaner selection for performances) peers out from his stall below. 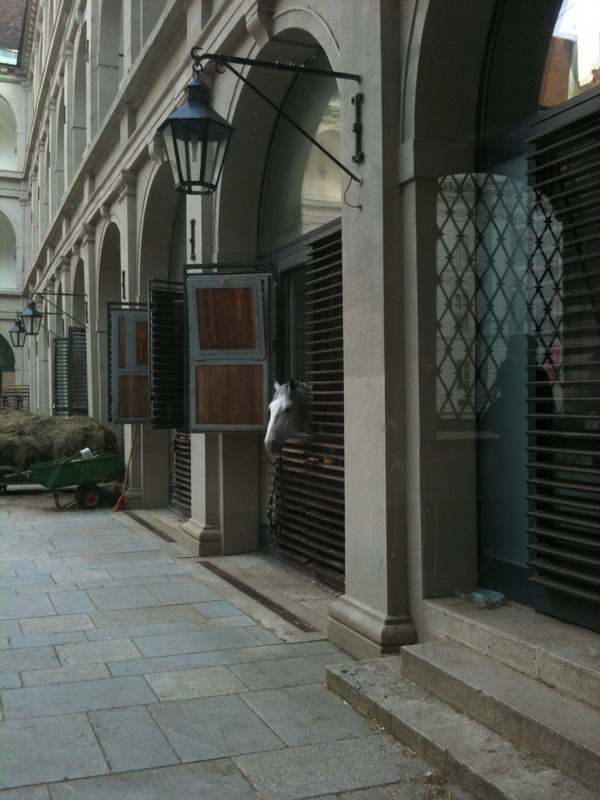 Lipizzaners were originally bred in Lipizza, Slovenia by Archduke Karl in 1580. 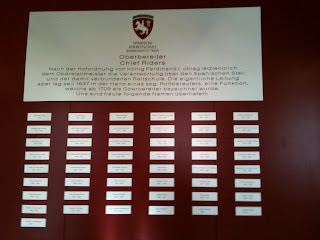 Currently, however, they are all bred in western Austria at the Austrian National Stud Farm in Piber (near Graz). The breed is a cross between Arab, Berber and Spanish horses which were excellent for battle. When young, they are grey or brown in color and turn white when they are older (they live for 30-35 years). Who knows why there is a Spanish Riding School in Austria...?? we practiced our Latin reading skills and Roman numerals! The Michaelerkircher (St. Michael's Church) in the Michalerplatz Square has a Medeival interior but a Neo-classical facade. Inside is housed numerous antiquities as well as an exquisitely carved pipe organ from 1714. Here inside of the Hofburg Complex is the Amalienburg (with a Baroque Clock Tower), built in 1575 for the son of Emperor Maximilian. Beneath the Baroque Clock Tower is, of course, the all-important sun dial! As we venture out of the Square, we see the spires of another distant Cathedral! Here is the Neue Burg, a huge curved building built on to the Hofburg Complex in 1881-1913. 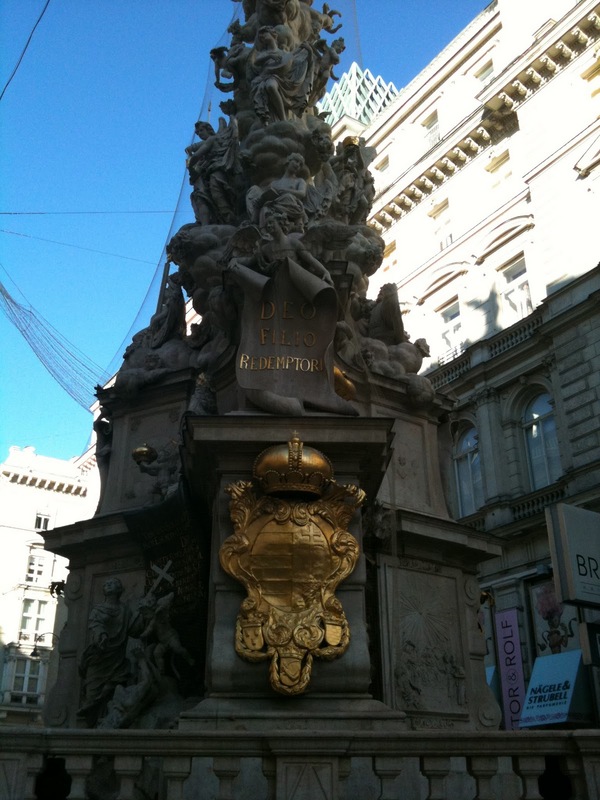 It is the last vestige of the Habsburg Empire....held together at that time only by Emporer Fanz Joseph. A mere 5 years later, the mighty Habsburg Empire collapses. Interestingly enough, Adolf Hitler stood in the terraced central bay (below) in 1938 to declare the 'Anschluss'....the 'union' of Austria and Germany. Nowadays, this is the National Library also housing museums. From here....we're beginning to get famished as it's only been 8 hours since breakfast and thousands of sites drain one's energy. 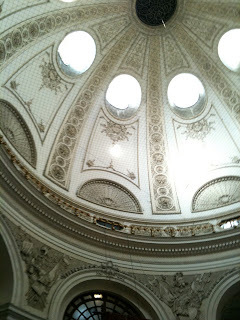 As we head away from this area, we are again drawn into the magnificent architecture in the Opernring. 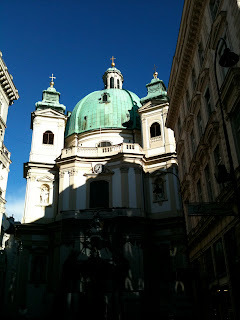 Here is the Karlskirche (left) in the Opera District. 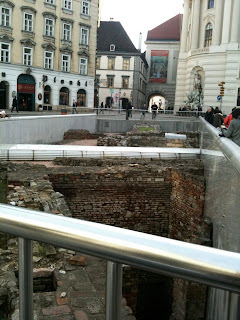 The backside of the Opera House, towards Albertina Platz. And right across the street from the Opera House is ... 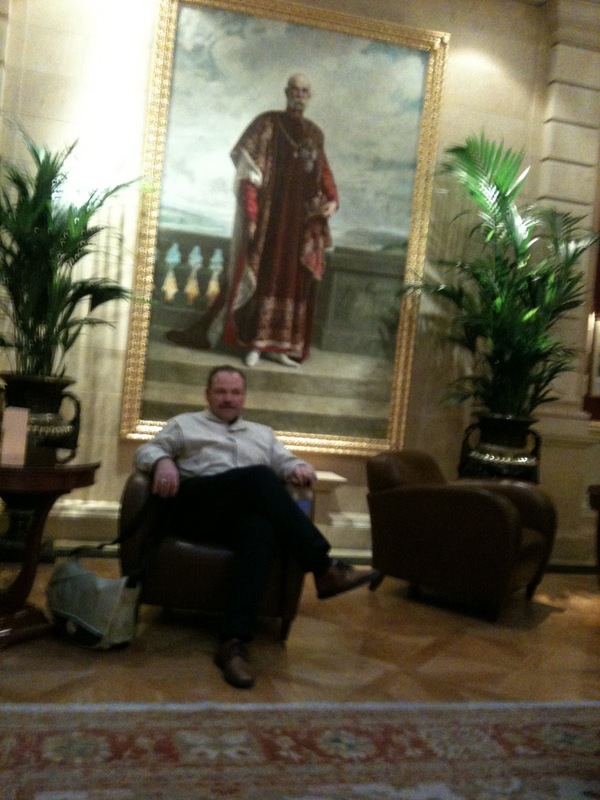 The Sacher Hotel! 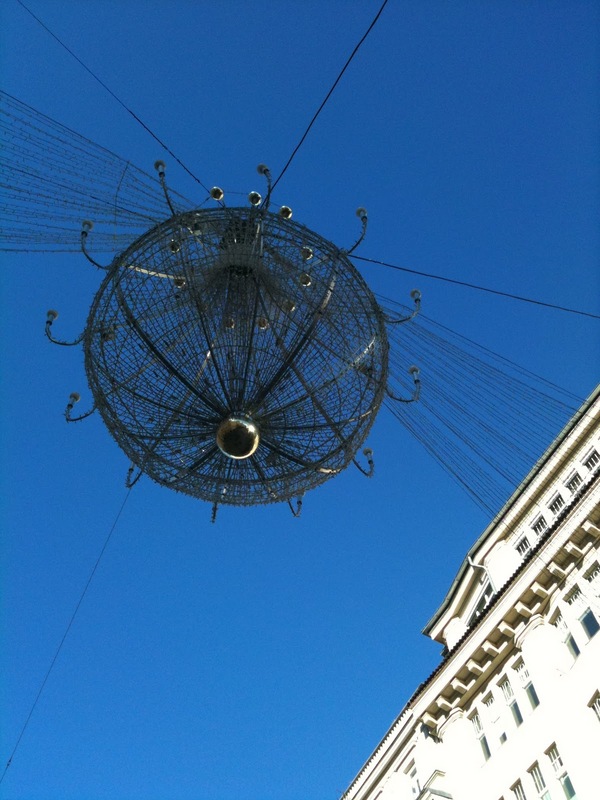 It's now time to head there for lunch and Sachertorte! Doesn't Mark look a bit starved? 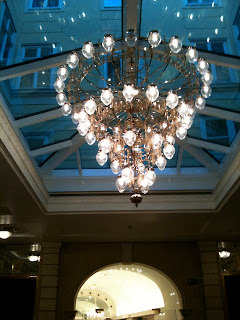 We dine under the opulent chandeliers, feeding the soul as well as the stomach. First we dine on French Onion Soup....a delicate, herb and Cognac-flavored soup in Mozart Cafe china. Meanwhile, Mark feasts on roasted lamb (more commonly served in western Austria) with roasted vegetables, plated on smashed potatoes with a thick, scrumptuous sauce! Then we examine the menu of tortes available for dessert. Note the famous Sachertorte pointed out below. 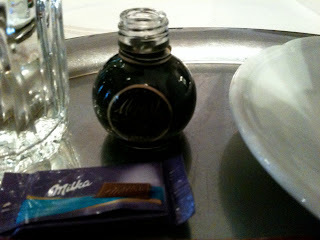 And here it is....the famous Sachertorte served in the original restaurant where it was created! A delicate, light set of chocolate layers, melded together with apricot glazing, and covered with a deep chocolate ganache. Exquisite! It is the best Sachertorte we have ever had (sometimes they're a bit dry....elsewhere). We also try a berry torte which is delightfully light and contrasts nicely with the traditional Viennese cafe. 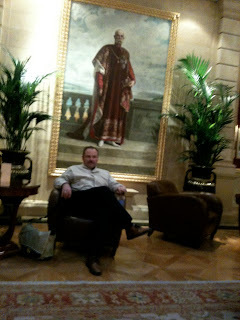 Mark pensively reflects on this 2-day Viennese excursion which has culminated in the Sacher Hotel. Awesome birthday Mark! OMG! 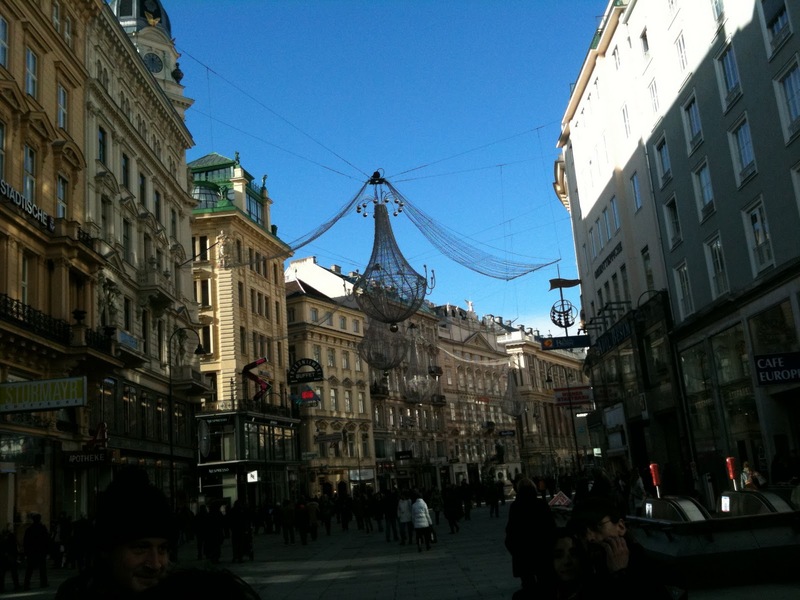 Vienna looks to have been an incredible alternative to Paris. BTW, I'm glad you took time for a hot toddy! It was a fun time, for sure! Hot toddy's seemed to flow quite nicely throughout the trip.